The summer Kamen Rider Build movie will take place after the conclusion of the show’s story. 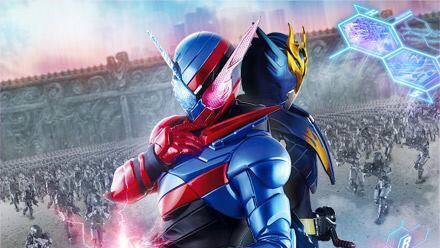 The as of yet untitled Kamen Rider Build summer movie will take place following the conclusion of the war for Pandora’s Box that divided Japan into three warring nations. The story is described as taking place in a period where Seito, Hokuto, and Touto all support each other, with new governors put in place on behalf of the old prime ministers. However, once again, Sento faces a new massive threat. Takahashi Fuji portrays the new governor of Seito. Seito includes the Kansai region and Fuji is from the Osaka Prefecture, he had to begin using the Kansai dialect in his role. Masanobu Katsumura will portray the new governor of Touto and be a key person in the story. Fans are asked to pay attention to how this impacts Sento, as Kamen Rider Build is based in Touto. Finally, Rena Matsui will portray the new governor of Hokuto, being the youngest governor at the age of 26. In my wildest dreams, I couldn’t imagine myself being invited to play this role in the Kamen Rider Build summer movie. It is an absolute honor. My script is filled with a lot of lines and I’m looking forward to filming. I want to fight with all my power so I’m not overwhelmed by the giant scale of Build’s worldview! I can’t believe that I was offered the role in Kamen Rider Build at my age. Everyone is reacting to the story and cast with excitement. I would like to take part in and honor the Kamen Rider Series I admired when I was a child. I was surprised that I could appear in the much loved Kamen Rider series. I think the appeal of the series is the ability for both small children and parents to enjoy it together. This is my first time in a tokusatsu and because I might be able to act alongside a transformed Kamen Rider, I think I can pour my all into everything and look forward to it. The role played by the three guest stars may even surpass that of the brilliant physicist, Sento Kiryu. The governors are astronauts went to Mars. It’s unknown if they’re friends or enemies, but they are connected to a huge mystery surrounding Build. It is also mentioned that a former astronaut will be cast in a new light and fans will unexpectedly agree with the importance the movie’s setting. UPDATE – Build chief writer Shogo Muto has also commented on Twitter that he will be writing the movie. Muto also revealed Kamen Rider Heisei Generations Final: Build & Ex-Aid with Legend Riders director Kazuya Kamihoriuchi will return to direct the summer movie.